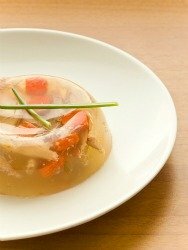 This simple aspic recipe turns bone broth into a delicious dietary meal that is a tasty dish served chilled. Also called jellied consommé this is a meal in which ingredients are set into a savory gelatin made from bone or meat broth. It is like your gelatin style salads except filled with cooked meats and cooked vegetables of your choice and covered with the broth. Then it is chilled until it becomes gelatin and served as a tasty cold dish. Bone broth is typically used as it produces a lot of natural gelatin from the bones when cooked. Extra gelatin is added to ensure the gelatin stays firm. You can serve it straight from a dish or remove it from a mold onto a plate. It has been enjoyed for centuries and is typically recognized as French cuisine. One thing for sure it is a nutritious and dietary meal that is best enjoyed on a hot summer day. Want to make your bone broth into a delicious cold meal for a hot summer’s day? It's actually real easy. Mix and soften the gelatin in 1/2 cup cold stock, then heat it with another 1/2 cup of stock until completely dissolved. Remove from heat and stir into rest of broth (whatever quantity you would like to make). Taste broth and spice to desired taste. Choose the consommé cups, dishes or molds you would like to use. Now comes the fun part. Roll up 2-3 black forest ham slices or use chunks of fresh ham if you have, cooked carrot slices and cooked peas. Place ingredients into the cups, as much or little as you like, depending on how filling you would like the meal to be. Cover with gelatin prepared liquid and chill in fridge till it sets. You can add any cooked meat (ham, chicken, turkey, or beef) and any cooked vegetables into the cups before covering it with the gelatin broth. The possibilities for a jellied consommé are endless. This meal is delicious, nutritious and dietary. As the name implies bone broth is a tonic which can benefit our bones providing necessary nutrients to help build them in our growing years and help maintain them as we get older. This is a great way to prevent osteoporosis in the future years to come. Get the kids to try it too. Some kids absolutely love it because of its fun jello like texture and all the goodies (meat & veggies) that are hiding in the middle just waiting to be devoured. It is another great way to get the kids eating healthy and it is definitely worth offering them this meal at least once if they are not sure. You can use the carrots that you originally made in the broth. Just remove after 2-3 hours so they don’t overcook. Put aside for later. Cut as desired for later use.